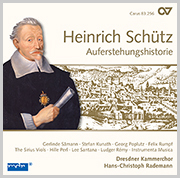 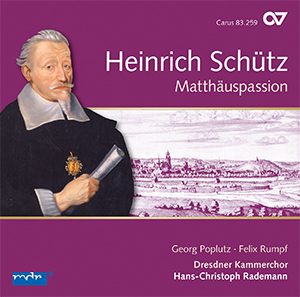 Volume 11 of the celebrated complete recording of Schütz’s works presents the St. Matthew Passion, SWV 479. 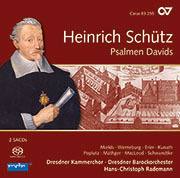 Schütz’s Passions according to the evangelists Matthew, Luke and John were all commissioned by the court in Dresden: they were pure a cappella settings of high artisanal standard combined with a profound, intensely personal expressivity, these works form the conclusion of Schütz’s settings of biblical scenes. 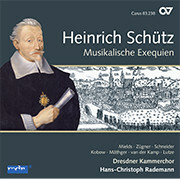 They are the mature works of old age, representing, as it were, the crowning conclusion of an entire musical epoch. 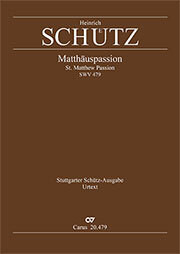 The St. Matthew Passion, the last of the three passion settings, was composed in 1666. 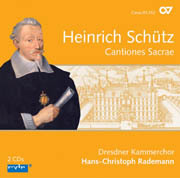 Particularly in this work the composer called for the Bible texts to be sung in an emphatic declamatory style, requiring flawless intonation and perfect comprehensibility of the words. 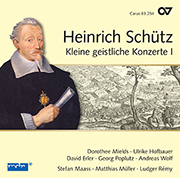 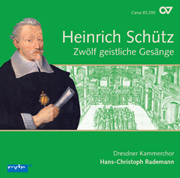 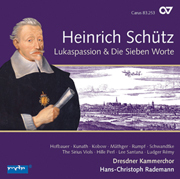 These requirements are effortlessly met by Georg Poplutz as the Evangelist and the excellent Dresdner Kammerchor under the direction of Hans-Christoph Rademann. 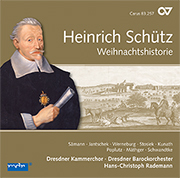 The CD program is ideally complemented by the "Litania" SWV 458, the psalm setting "In dich habe ich gehoffet, Herr" SWV 128, as well as "O du allersüßester und liebster Herr Jesu" SWV 340.